Marine chronometers were essential for navigation and these days they make great desk timepieces. All our chronometers have been overhauled and sympathetically restored. They are in good working order and have a 12 month guarantee. Delivery is free in England and Wales and we will be pleased to arrange packing and shipping of any item, to anywhere in the world. 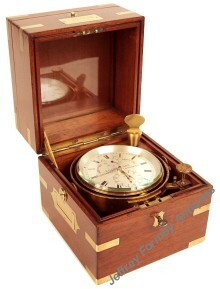 We also have some good books for sale on marine and pocket chronometers and deck watches. A good 2-day marine chronometer in its original 3-tier mahogany box, signed on the silvered dial Lilley & Son 10. London S.t London. E.C. 1660 and engraved Makers to the Admiralty.